Bellatrix, I'm a Pug! : I pulled it off! So remember that Valentine's day card I made mom? 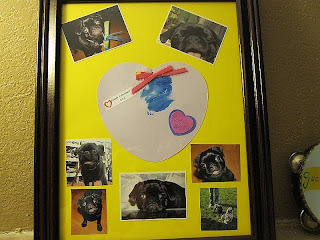 Well, she told dad she wanted it framed, so dad and I set out on a mission....get mom all mushy and gushy about me! So daddy took all her favorite pictures of me from the past 6 months and frame them around the card. He even included one of me and bestest bud Spencer! We surprised mom tonight when she came home from a play. She was all happy and huggy so I think it was successful. Dad said we did good and I'm happy because I'm totally gonna get extra hugs over it. Way to go Dad & Bella! Those pictures are insanely cute. Puglet was never that cute, and I'm not just saying that because he steals my toys. Hiya Dutch...I would love to see baby pictures of you and Puglet. I know you were the cutest baby Dutch ever. That shot of you in the upper right corner is my fave. The same one you use for your posts.It looks like someone just told you the funniest joke ever! Thanks Wilma, it's my happy pug face. Mom took it after days of rain we finally had some sunshine. I was sooooo happy to finally get outside and stay dry, that I just smiled away. Spencer...dad said he made extra pictures of us together...I will have to bring it to our next play date. Mom says she still has heart palpitations when thinking of me running off leash...she even got nervous when you ran off leash! shesh our moms are nervous nellies.